Who doesn’t like a little blood and brains in their cranberry martini? 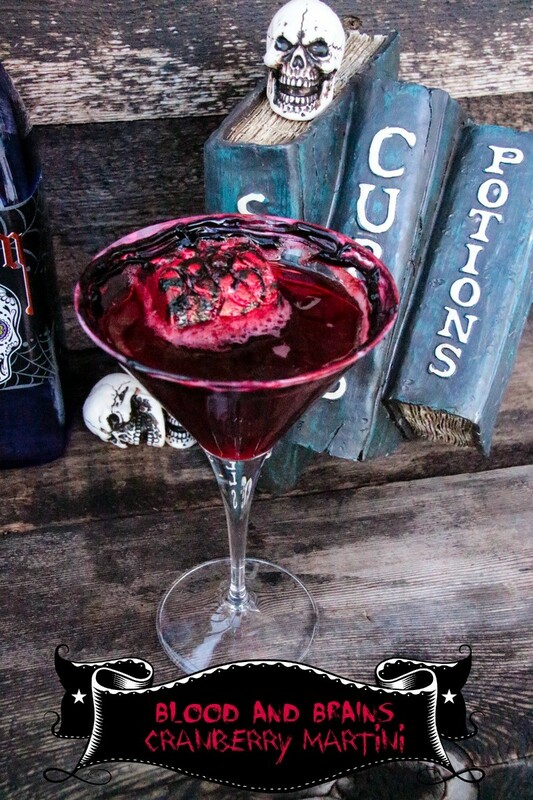 Below, you will find our recipe for Blood & Brains Cranberry Martini. True it looks gross, but it tastes pretty darn good. 1. Prepare marshmallow, using a Xacto Knife cut curlicue designs and a line separating the two hemispheres into a marshmallow. Using a Q-Tip dipped in black food coloring, dab the marshmallow leaving spaces in-between. Let the marshmallow set for about 10 minutes. Then using the other end of the Q-Tip or use another one, dip end into red food coloring and fill in the spaces. 2. Using two small cups, scoop a tablespoon of marshmallow cream into each cup. Drip a few drops of red food coloring into one cup and a few drops of black food coloring into the other cup. Mix until one marshmallow cream cup is completely red, and other is totally black. Using a Q-Tip, rim martini glass with red and just beneath the red rim with the black marshmallow cream, set aside. 3. In a martini shaker combine pomegranate soda, cranberry juice, and cranberry vodka. Add ice cubes and shake vigorously. Strain into prepared martini glass and garnish with the bloody brain marshmallow. Prepare marshmallow, using a Xacto Knife cut curlicue designs and a line separating the two hemispheres into a marshmallow. Using a Q-Tip dipped in black food coloring, dab the marshmallow leaving spaces in-between. Let the marshmallow set for about 10 minutes. Then using the other end of the Q-Tip or use another one, dip end into red food coloring and fill in the spaces. Using two small cups, scoop a tablespoon of marshmallow cream into each cup. Drip a few drops of red food coloring into one cup and a few drops of black food coloring into the other cup. Mix until one marshmallow cream cup is completely red, and other is totally black. Using a Q-Tip rim martini glass with red and just beneath the red rim with the black marshmallow cream, set aside. In a martini shaker combine pomegranate soda, cranberry juice, and cranberry vodka. Add ice cubes and shake vigorously. 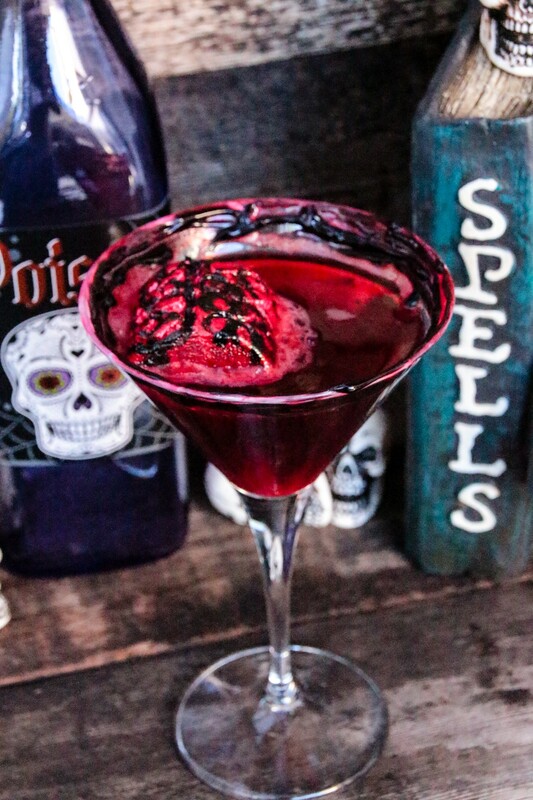 Strain into prepared martini glass and garnish with the bloody brain marshmallow.